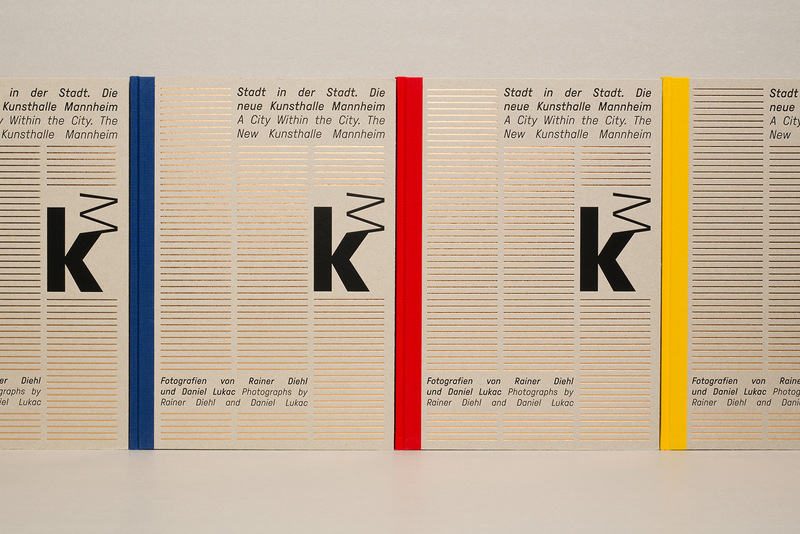 the book “a city within the city. 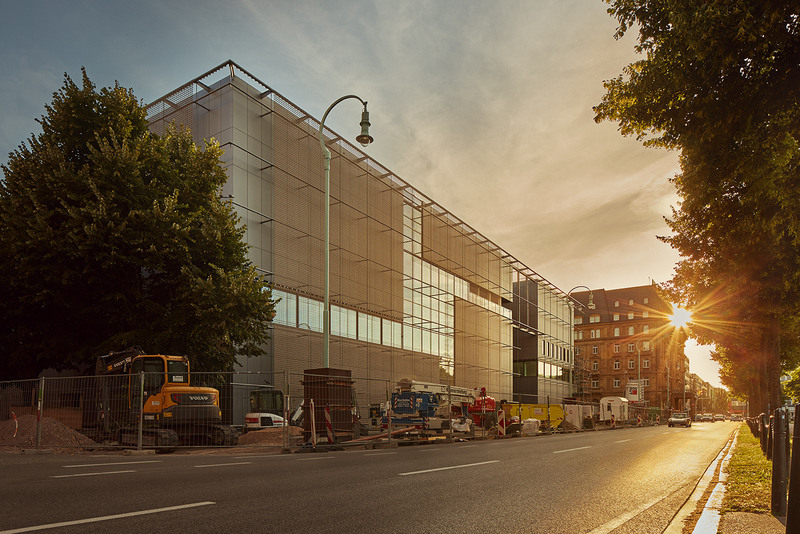 the new kunsthalle mannheim” documents the construction process of the currently largest new museum building in germany. 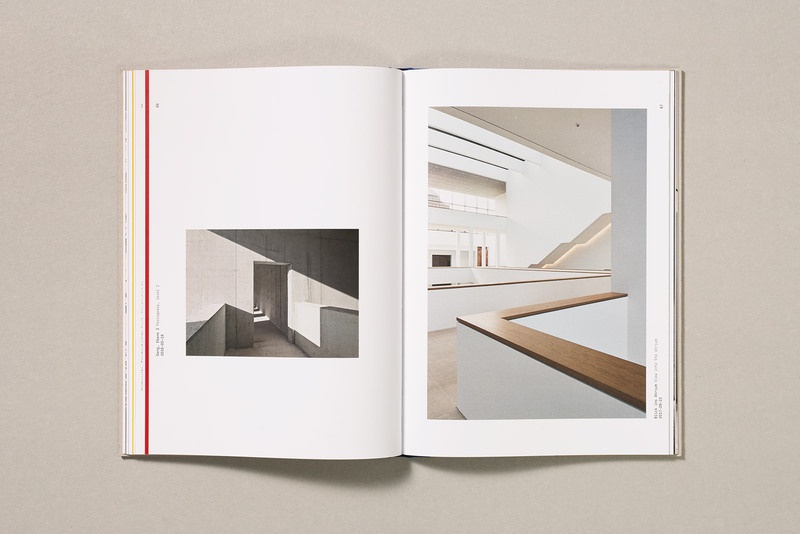 two resident photographers, rainer diehl and daniel lukac, captured this three-year long process in a beautiful blend of architecture and journal style photographs. 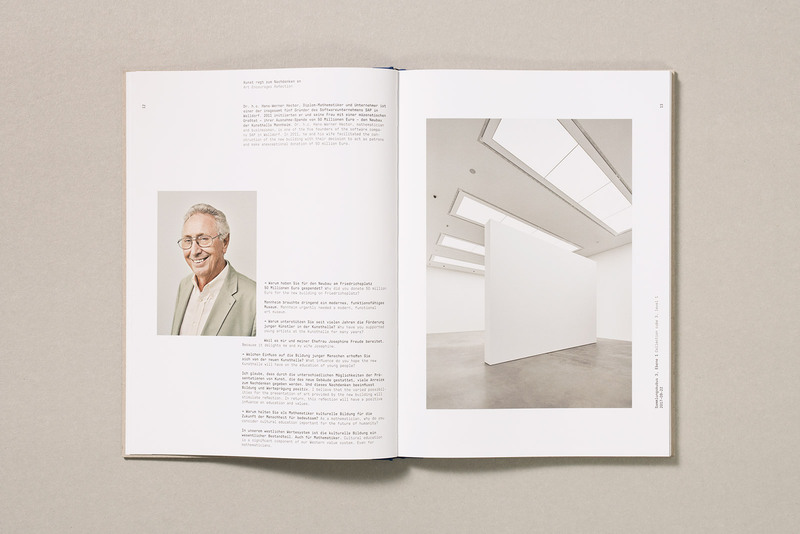 selected pictures were mixed with related editorial contributions like a conversation between the directress of the kunsthalle and the architect, interviews with sponsors, artists, and representatives of the city. 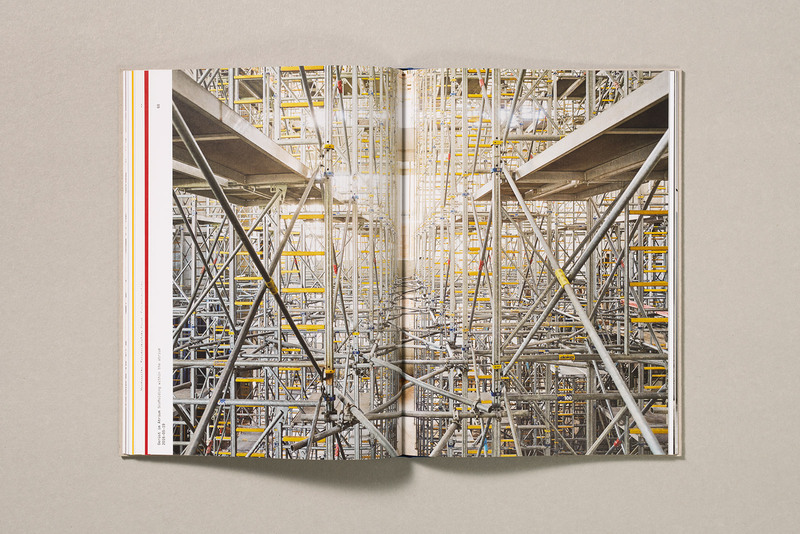 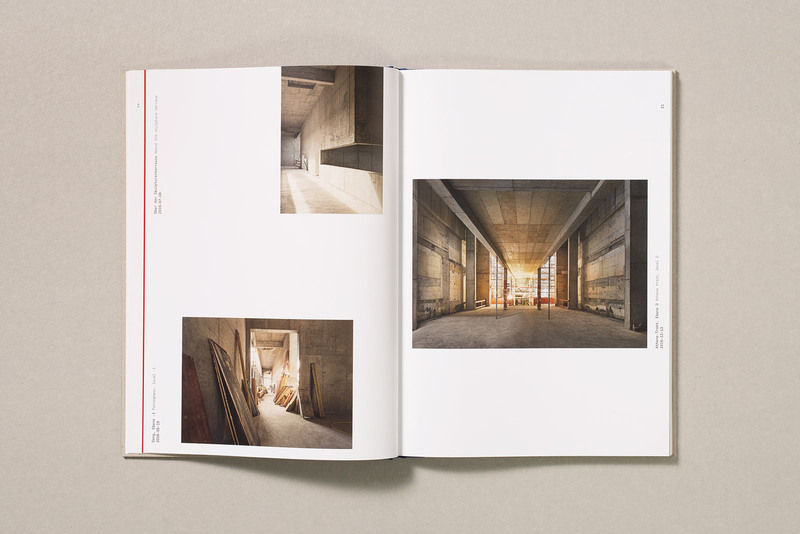 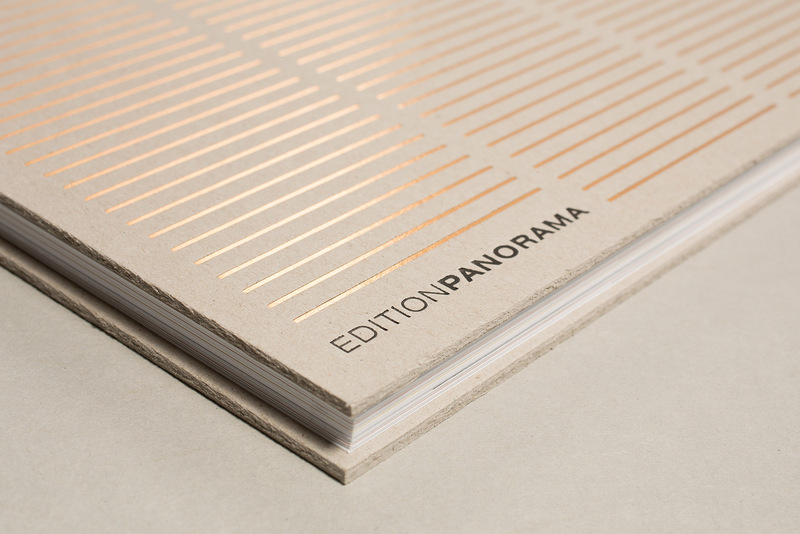 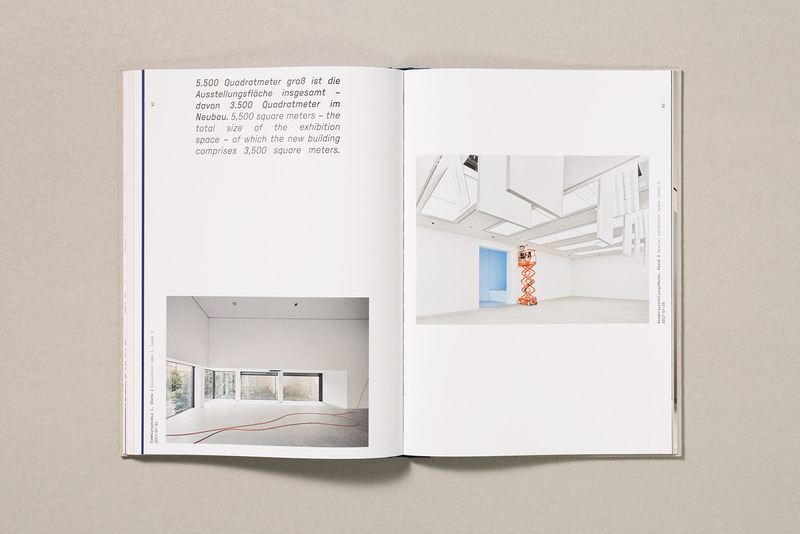 the visual concept of the 25 x 35 cm large book takes up architectural elements of the building. 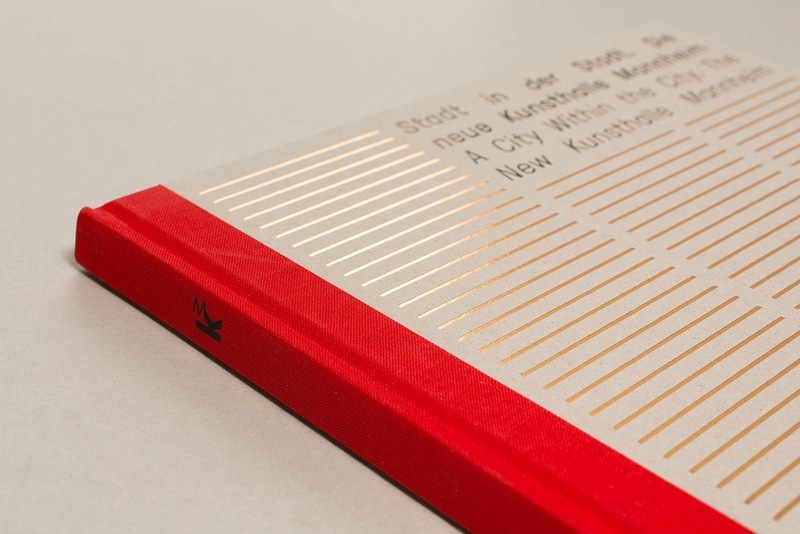 the all around metallic embossing on the front and back cover reflects the facade of the museum with its metallic mesh. 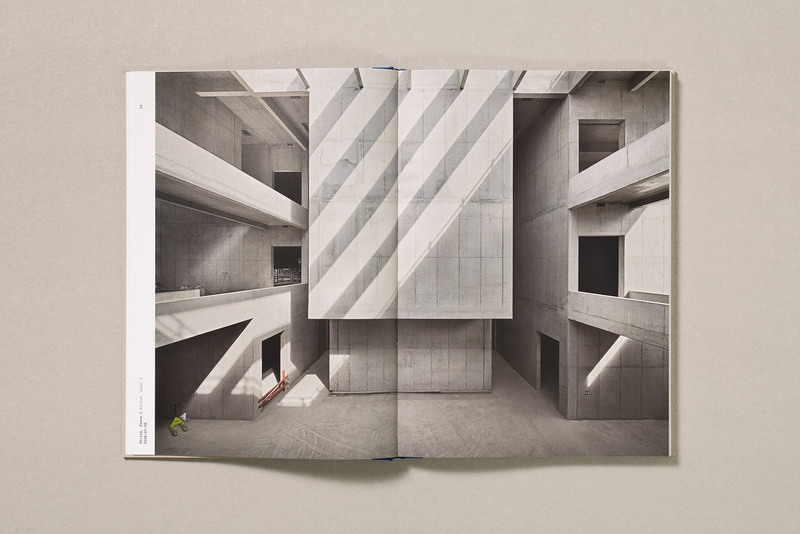 the character of the raw cardboard refers to the grey cement panels on the facade and creates a visual link to the image motifs featuring the shell construction and concrete walls. 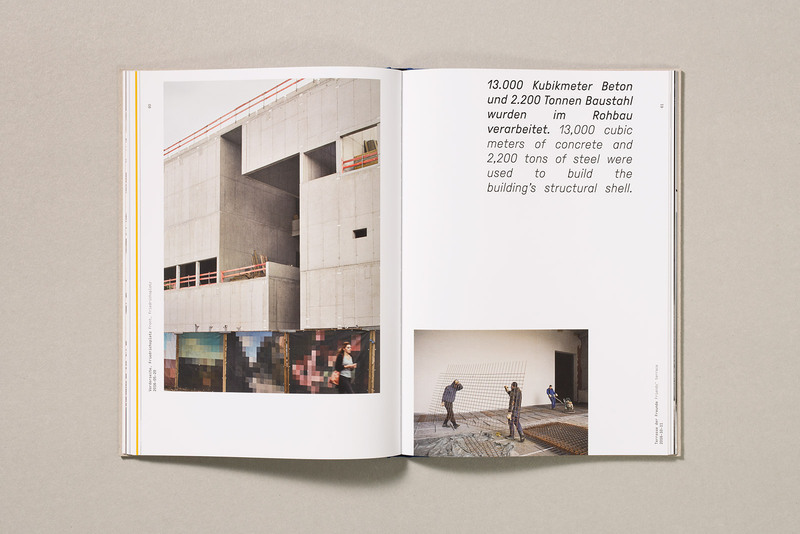 the pictures are not displayed in chronological order, rather they are arranged with an eye on context, imagery and dramatic composition. 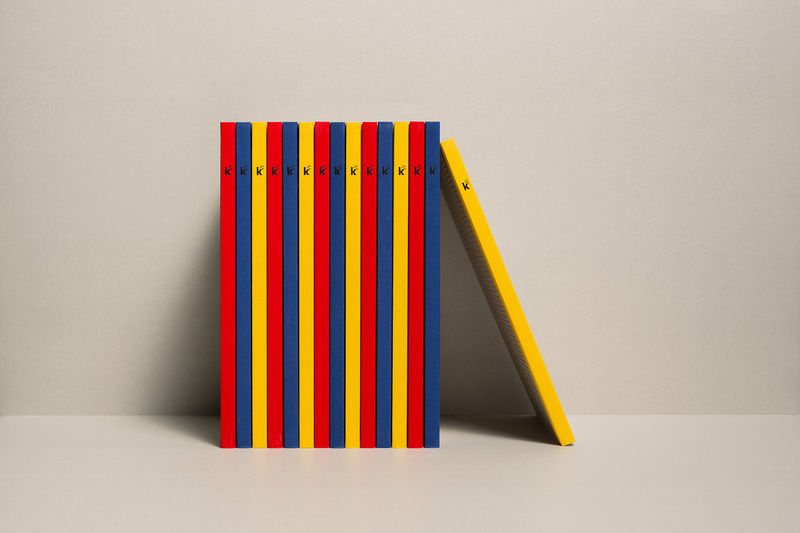 the applied colors red, blue, and yellow which are known as basic colors in color theory symbolize the artworks, which will be presented in the building after its completion. 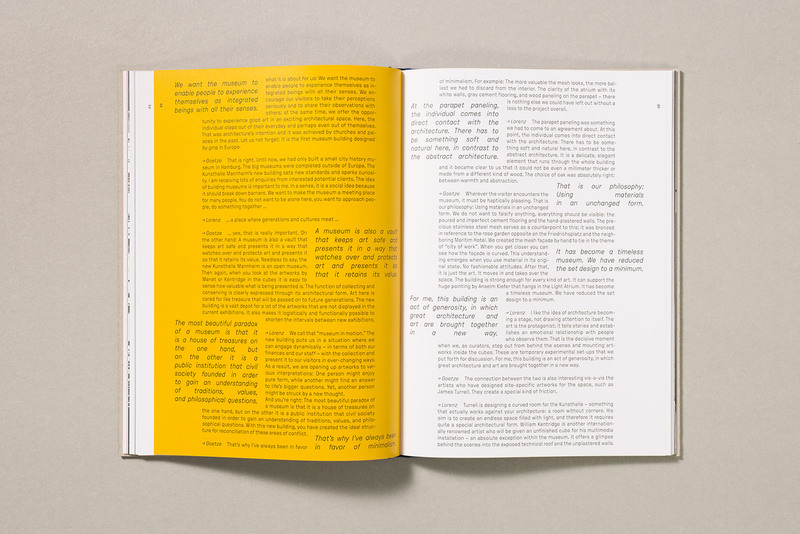 inside the book, one full-page colored sheet appears every sixteen pages. 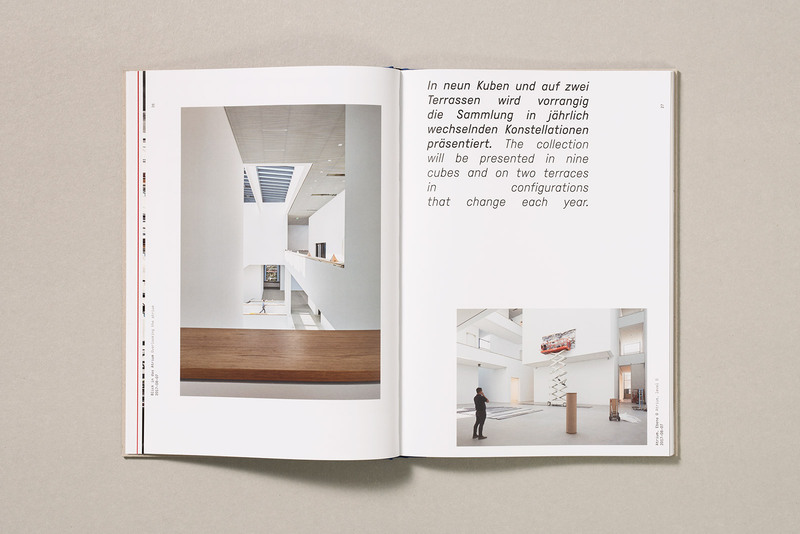 the justified typography emphasizes the cubical architecture of the kunsthalle. 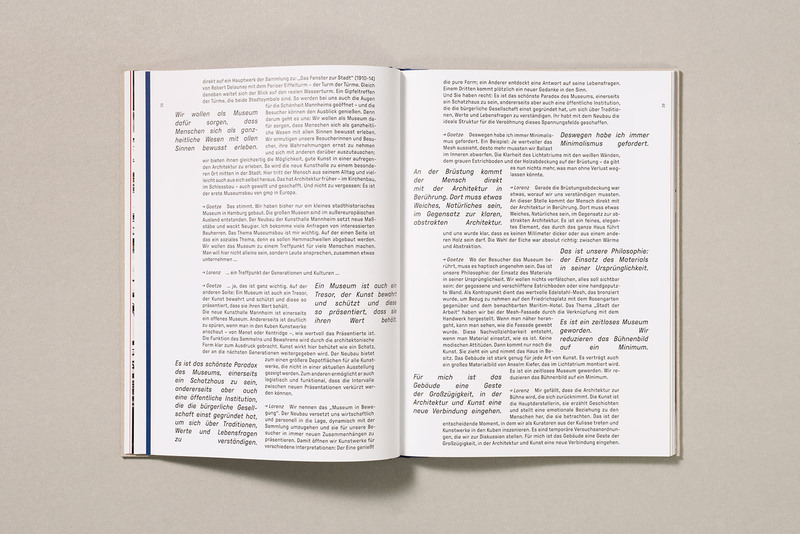 the unfinished, crude look of the cursive headlines convey an impression of the work in progress. 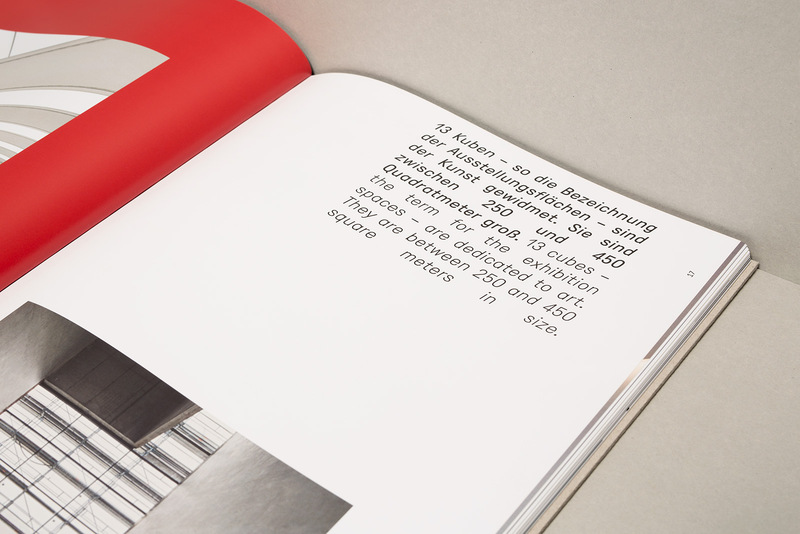 additionally, to keep the overall journal look, some texts are set in a contrasting monospaced typewriter style. 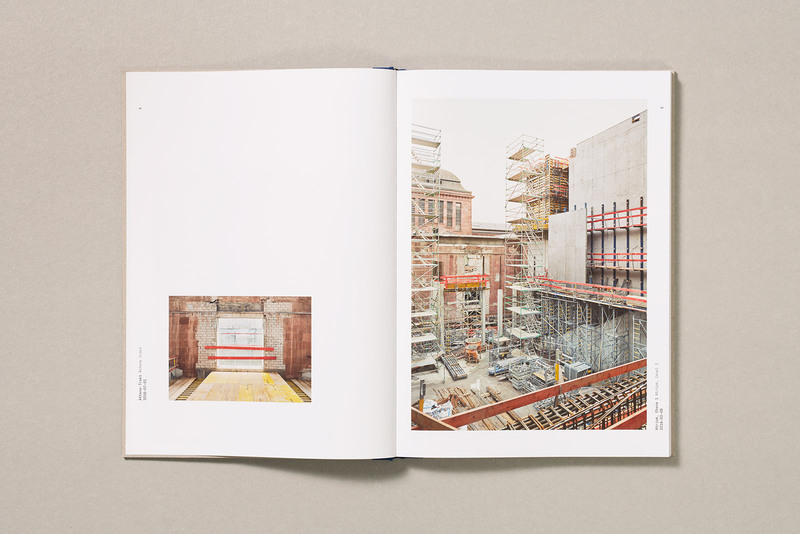 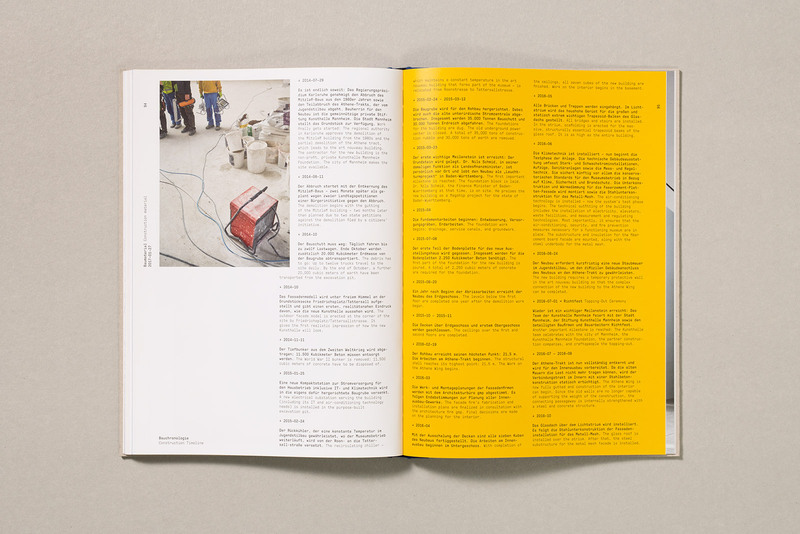 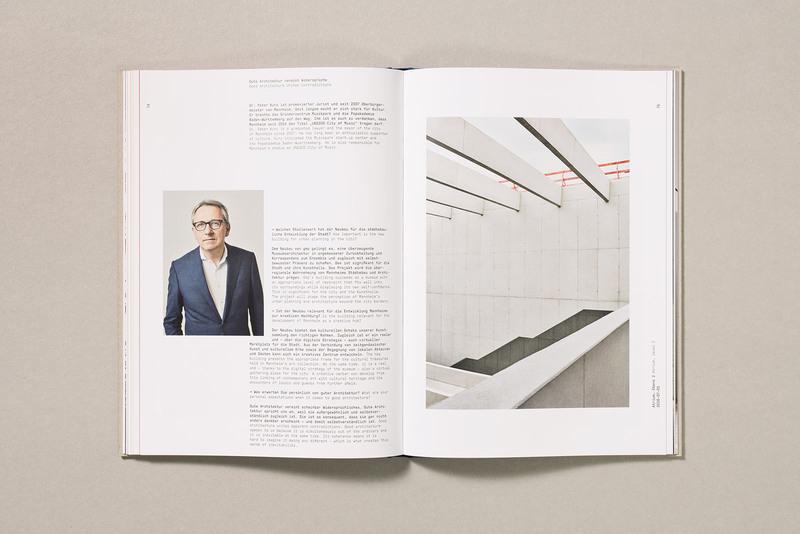 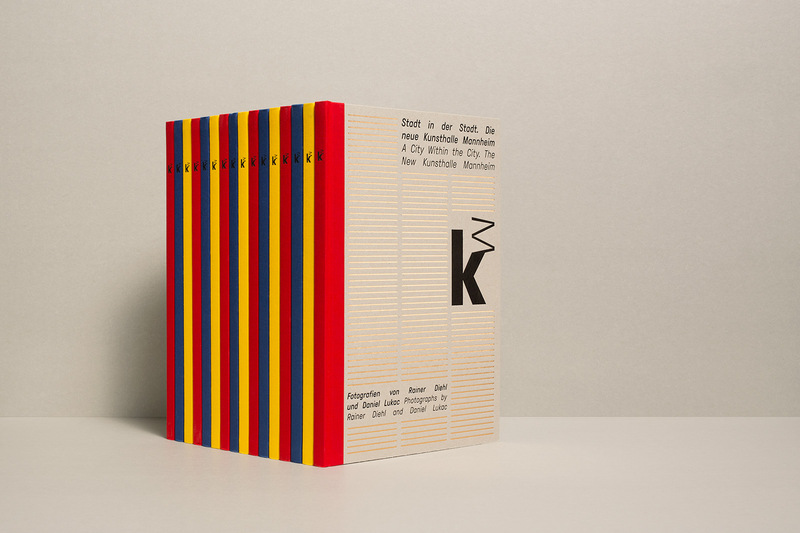 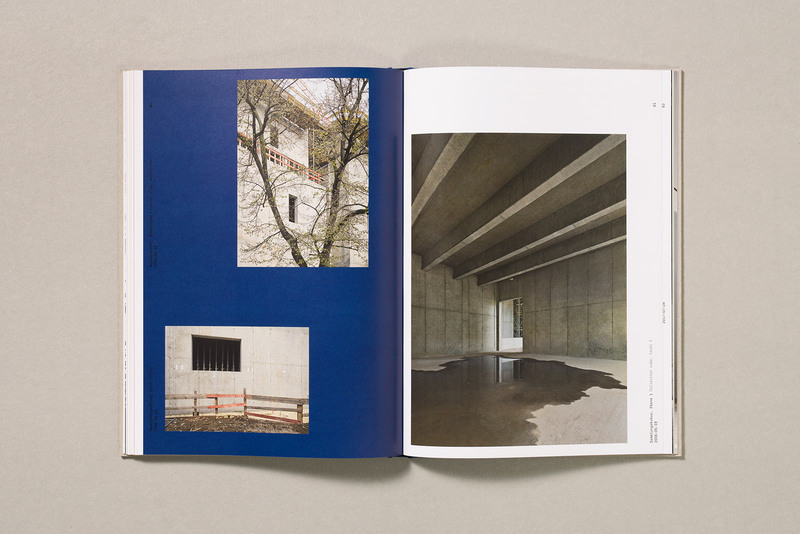 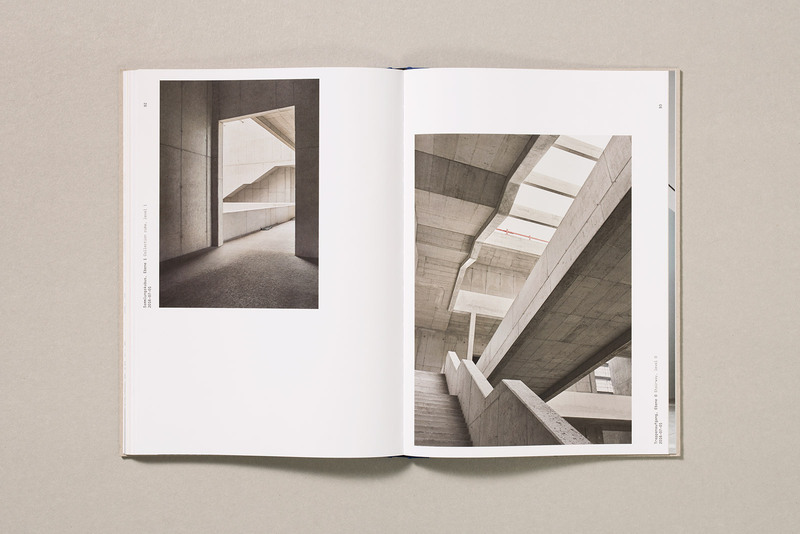 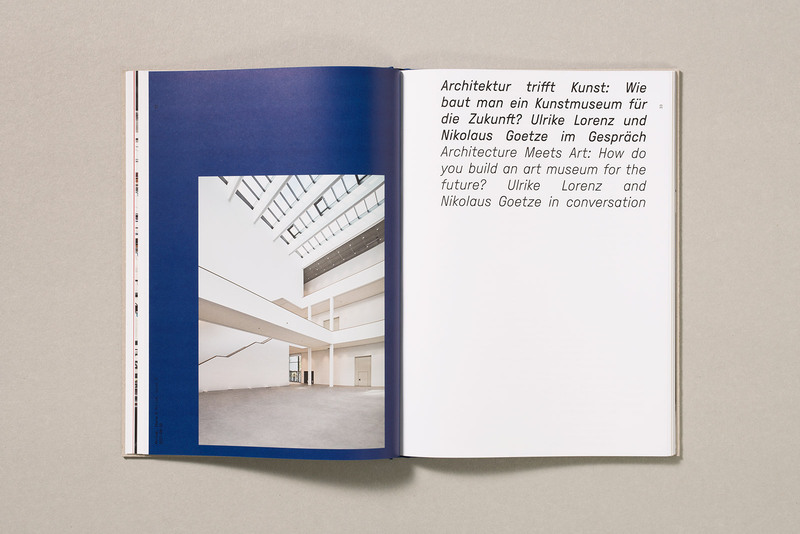 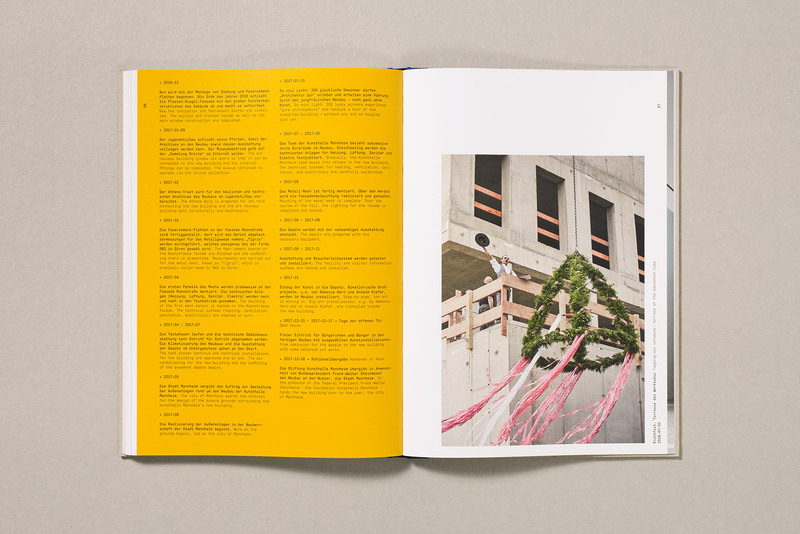 the book is published by the kunsthalle mannheim and is a collaboration of the kunsthalle team, daniel lukac and rainer diehl from studio h7photo.com, visual artist ann christin schuhmacher, the publishing house edition panorama and vonfreyhold visual communication – contributing the art direction and book design. 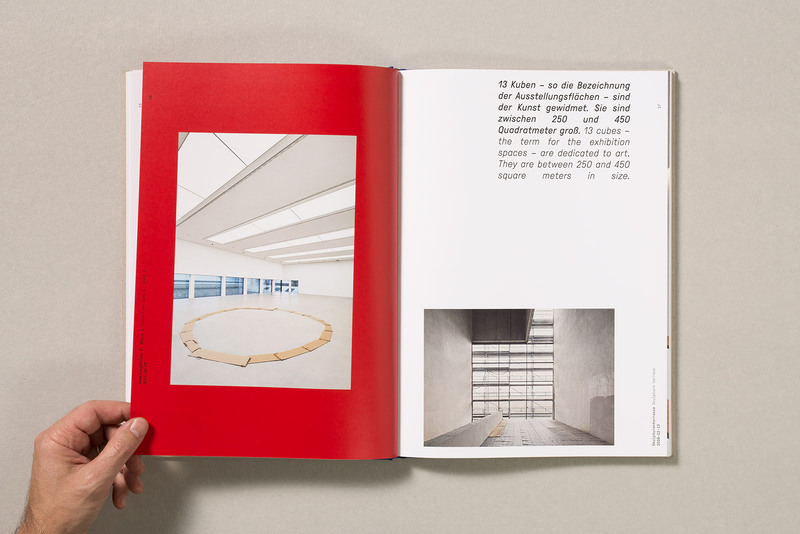 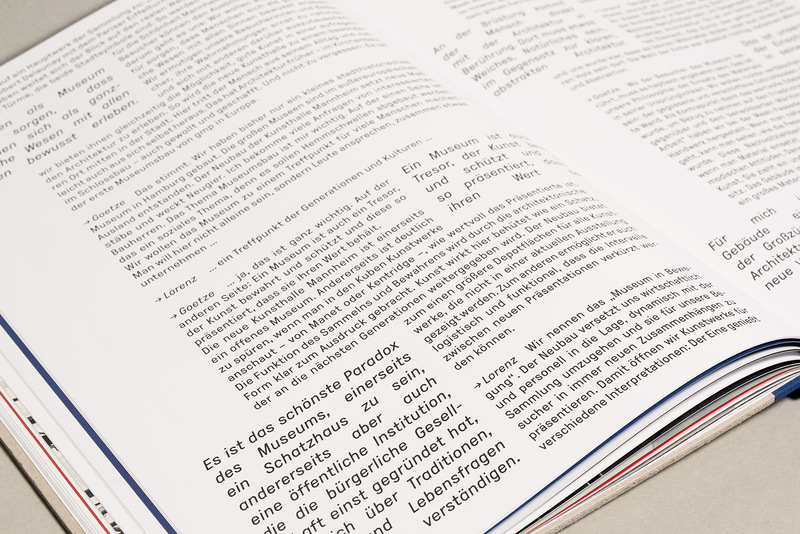 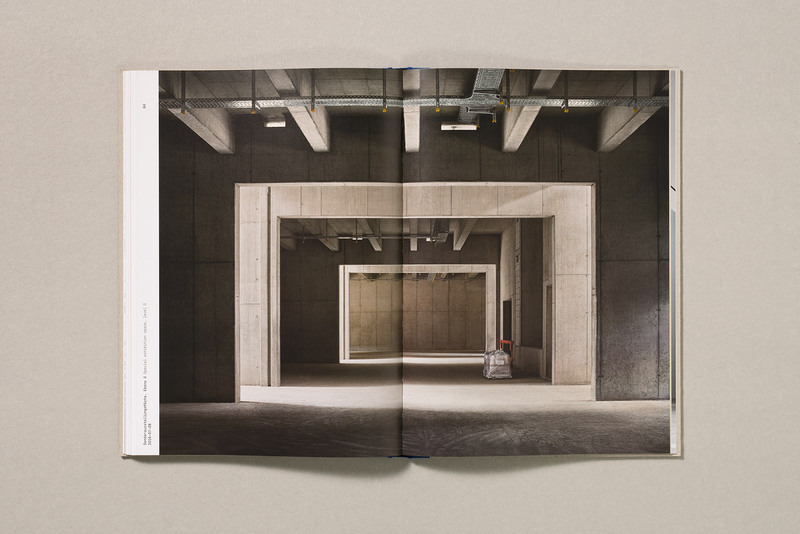 it is distributed by the kunsthalle mannheim and edition panorama. 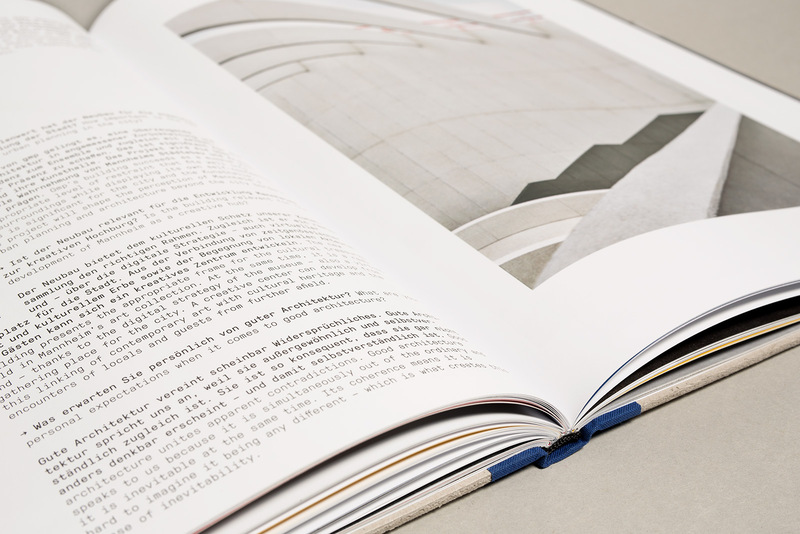 112 pages, 90 photographs, 7000 copies. 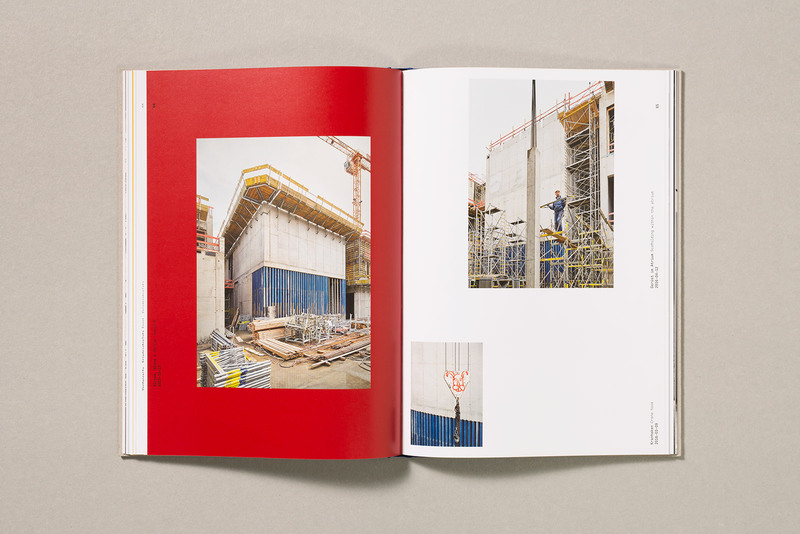 images © lukac/diehl. 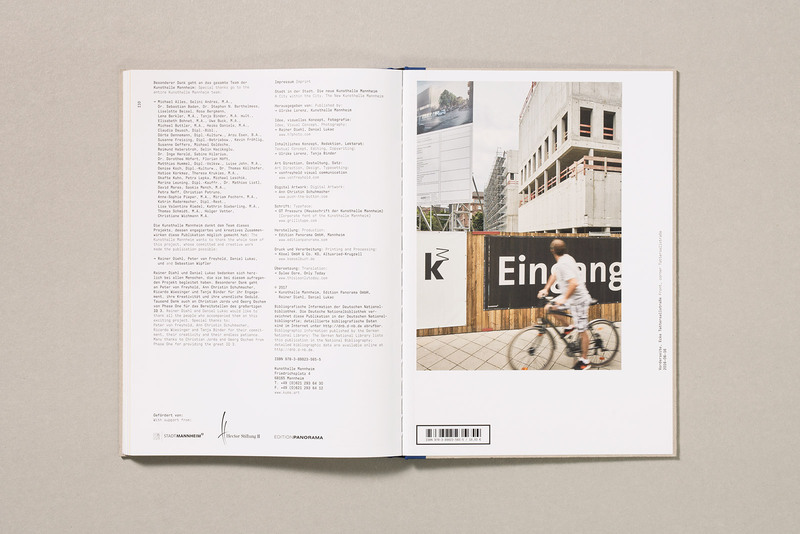 awarded with bronze at the german photobook award 18|19.